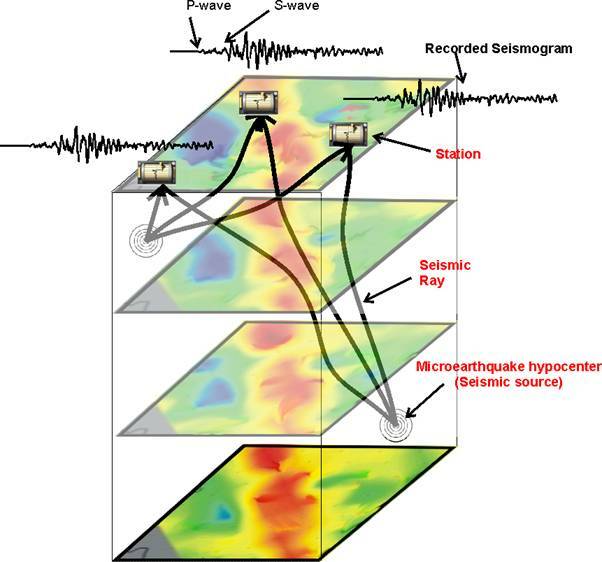 Passive Seismic Tomography (PST) is a new revolutionary geophysical exploration technique utilizing the natural microseismicity, (microearthquakes with magnitudes of -1 up to 2.0 Richter) which occur almost everywhere, as seismic sources and a portable specially designed network of seismometers on the surface to record continuously for a period of a few months. LandTech was the first company which introduced the method of high resolution passive seismic tomography for hydrocarbon exploration at a local scale, back in 1998. In addition to the specific hardware it has designed new inversion algorithms and neural network or fuzzy procedures for the reliable processing of the acquired passive data. After determining the hypocenters of microearthquakes we use them as seismic sources embedded within or below the target of interest and perform 3D seismic tomographic inversion of the P- and S-wave travel times to the surface recorders. Since the seismic sources are below or within the target of interest we do not have a two wave travel of the seismic wave (in conventional seismic since the source is at the surface the seismic wave has to travel down and then up) but only one seismic ray path from the source to the surface, so this technique is specifically suited for regions of bad penetration problems (thrust belts, heavy weathered surface layers etc.). By modifying the 3D velocity model and the seismic ray paths and minimizing the difference between theoretical and measured travel times at the surface we end up with an accurate 3D velocity model.